As I said in my previous TBR post, I’m currently doing four weeks of practice teaching for my on the job training. In my seventh grade english class, we are starting to read Freak the Mighty by Rodman Philbrick. Today, I finished the novel for the very first time and I’ll be reading it for the second time in class to my students. I’m really surprised to have never heard of such a heart warming young adult book and I have a feeling that this story will stay with me for quite a long time. 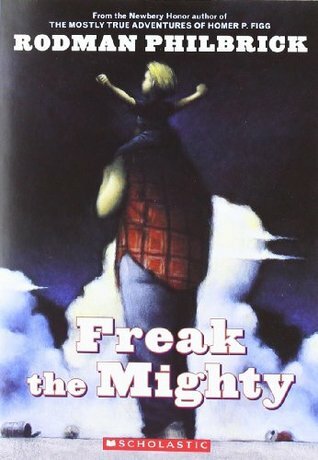 Freak the Mighty is the story two young boys with total different personalities, who become the best of friends. Max is big and Kevin is small. Max is a slow learner and Kevin is a genius. Together, they are Freak the Mighty. Both characters are extremely easy to love and very relatable. This story focuses a lot on their friendship, but also touches growth disorders. Kevin, also known as the Freak throughout this novel, is diagnosed with Morquio syndrome. This means that his insides are essentially growing faster and bigger than his outsides. Freak the Mighty is extremely thought provoking and touching. I enjoyed this quick read so much and I highly recommend it. 5 out of 5 stars. Click here to view the authors website!